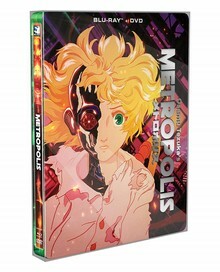 Metropolis is a spectacular film featuring stunning imagery and unforgettable characters based on the classic comic created by revered manga artist and animator Osamu Tezuka (Astro Boy), written by anime legend Katsuhiro Otomo (Akira) and directed by Rintaro (Galaxy Express 999). In the industrial, tri-level world of Metropolis, Duke Red is a powerful leader with plans to unveil a highly advanced robot named Tima. But Duke Red’s violent son Rock distrusts robots and intends to find and destroy Tima. Lost in the confusing labyrinth beneath Metropolis, Tima is beginning a friendship with the young nephew of a Japanese detective. But when Duke Red separates the two innocents, Tima’s life and the fate of the universe are dangerously at stake. Special Features: The Making of Osamu Tezuka’s Metropolis documentary featurette also featuring interviews with the film’s creators along with concept animation comparisons! Presented in Amazing High-Definition Presentation, English SDH subtitles and English Translation English DTS-HD Master Audio 5.1 with uncompressed Japanese audio.